Climate change-induced tree mortality is occurring worldwide, at increasingly larger scales and with increasing frequency. How climate change-induced tree mortality could affect the ecology and carbon (C) sink capacity of soils remains unknown. This study investigated regional-scale drought-induced tree mortality, based on events that occurred after a very dry year (2012) in the Carpathians mountain range (Romania), which caused mortality in three common conifer species: Scots pine, Black pine, and Silver fir. This resulted in hot-spots of biogenic soil CO2 emissions (soil respiration; Rs). 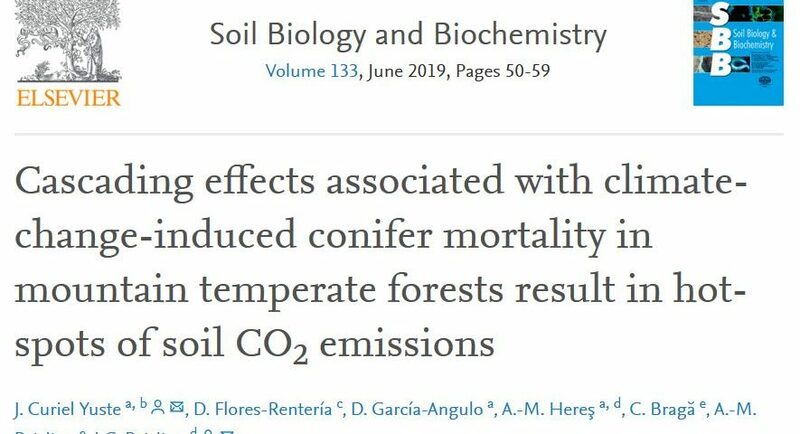 Four to five years after the main mortality event, Rs-related soil CO2 emissions under dead trees were, on average, 21% (ranging from 18 to 35%) higher than CO2 emissions under living trees. Total (Rs) and heterotrophic (RH)-related soil CO2 emissions were strongly related to alterations in the soil environment following tree mortality (e.g. changes in quantity and quality of soil organic matter, microclimate, pH or fine root demography). Moreover, the massive mortality event of 2012 resulted in greater presence of successional vegetation (broadleaf seedlings, shrubland and grasses), which may control the environmental factors that either directly or indirectly affected biotic soil fluxes (Rs and RH). 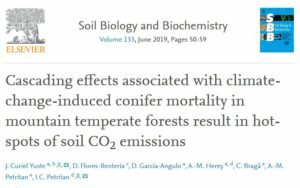 Besides the well-known direct effects of climate change on soil CO2 emissions, the cascading effects triggered by climate change-induced tree mortality could also exert a strong indirect impact on soil CO2 emissions. Overall, climate change-induced tree mortality alters the magnitude of environmental controls on Rs and hence determines how the ecosystem C budget responds to climate change.